An ambitious plan to bail out hundreds of women and teens from city jails was meant to as well-intentioned gift — one that’s now wrapped in red tape. When the idea was announced last month, the Robert F. Kennedy Human Rights group expected to be able to bail as many as 60 people out every day, according to an email to volunteers obtained by the Daily News. But since it officially launched last week, the hoped-for deluge has been more like a trickle, thanks in large part to to the Correction Department’s archaic bail processing system, the organization has said. The group had a rude awakening in the first heady days of the social justice campaign when one volunteer posted bail in the afternoon — but the inmate didn’t get out until 2 a.m., when it was too late to connect with social services. Now the Robert F. Kennedy Human Rights group only sends volunteers into Rikers Island with bail money between the hours of 9 a.m. and noon — the latest they can spring an inmate and still be sure the person can get the help they need. Each inmate gets to sit down with a social worker from the group or another city charity, which is part of the non-profit’s Mass Bail Out program. The social workers help with a range of issues, including securing housing for those who have nowhere to go. The slow schedule means some of the volunteers who signed up with Robert F. Kennedy Human Rights to deliver bail money — by law, bail can only be paid by an individual — have nothing to do. One volunteer eager to be part of the social justice program has been rescheduled three times because the process is so slow, The News learned. On Thursday, the organization declined to specify how many inmates have been released. McMullen said “dozens of people” — whose names have been put forward by by Legal Aid lawyers, inmate advocacy groups and public defenders — have left Rikers thanks to the program. The Kennedy charity has raised more than $3 million, including $100,000 from donations made after the initiative was announced last month. But criminal justice experts say it would likely take more than $30 million to bail out 500 women and teens. McMullen told The News there wasn’t a hard number that defined success for the program. The de Blasio administration has assisted the initiative in a variety of ways. 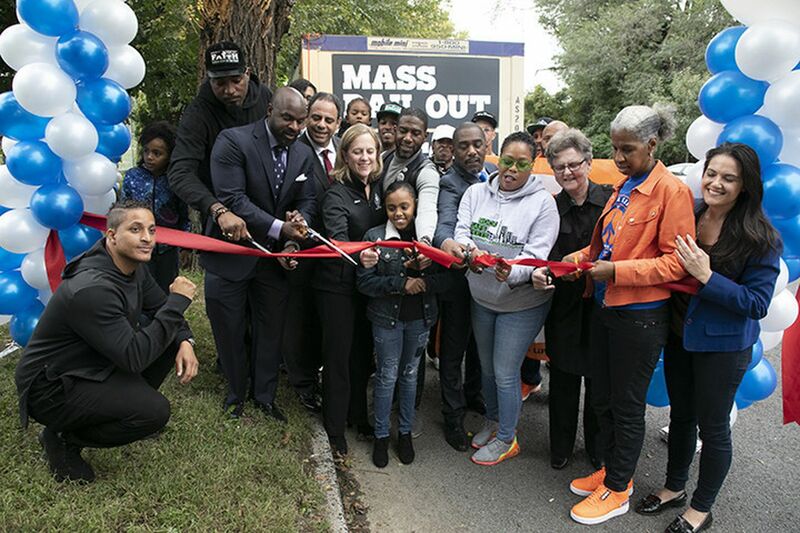 It gave the okay for a temporary makeshift welcome center outside Rikers Island, where volunteers greet bailed out inmates with cell phones, Metro Cards or transportation to a city shelter or other housing spots for those in need. A mayoral spokeswoman also denied there were any issues with the city’s bail system — although it did request that nobody be bailed out past 6 p.m. to avoid night releases. “No one will be turned away from a bail window if they have the money to pay someone’s bail, period,” said Natalie Grybauskas. Correction staff have long struggled to speed along the bail process. In each case, civilian staff send payment details to one of the city’s multiple lockups on Rikers via fax. They also must mark each bill to make sure it isn’t counterfeit and show a photograph of the inmate to make sure the right person is being freed. The average time it takes to bail someone out ranges from two to five hours, according to department records. Before inmates are released, jail officials also must make sure the person doesn’t have any outstanding warrants from other jurisdictions. All told, officers and supervisors must complete a 15-step checklist before inmates are released. In April, a busted fax machine held up the release of any inmates from one facility for hours. A day later the city launched an online payment system which had been in the works for over a year. Critics say that system is deeply flawed because inmates can’t use it unless a judge specifically gives permission for that form of payment. Also, there’s a $2,500 limit and a 2.49% fee. City and state elected officials have called for sweeping reforms to the overall bail system. Gov. Cuomo supported a plan to end cash bail for many low level crimes but the measure stalled in Albany during last legislation session.